Blog from Cairns, Queensland | Where's Suzie? Well what a day I've had. Got to type quick as I've only got about 9 mins on the internet so here goes. Set out on a boat trip to the reef this morning on a boat called Osprey, the fastest service to the reef, stopping at 2 locations with around 5 hours of diving or snorkelling. Got on the boat at around 8.30am and asked the captain about the weather and he said it was gonna be a little bit bumpy but not too bad. Well, the sea was a rough as anything, the boat was all over the place and loads of people were sea sick. 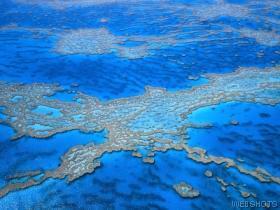 We got out to Norman and Saxon Reef and the boat was bobbing around and was only a little better than going along. I really wanted to snorkel but the sea was so rough I wasn't going to chance it just being a novice (and feeling completely ill). It was at this point I decided to book myself on the Helicopter ride which was gonna drop us off at Cairns so managed to grab the last place. We had lunch (well everyone else did - I had a couple of biscuits) and went onto our next location Hamilton reef but the weather got worse and a storm came along. It was raining and really windy. Got to see some cool fish just from the side of the boat, especially Willy the giant Wrasse who was huge and really friendly coming right up to the boat and some turtles. I got chatting to the captain who was really good at taking my mind off the awful conditions and an english couple who were also getting the helicopter to get off the boat. Anyway, the heli arrived on a really small platform in the middle of the reef and we all got the glass bottom boat over to get it, which was fun as it was all over the place and we all got soaked. Finally got to the heli pad and were strapped in quickly and took off. Well, after years of saying I'd never get in a helicopter this was the best thing I've done all my trip. I started feeling better instantly and the views were amazing. We all had headphones on and were listening to chill out music whilst the pilot told us about the different reefs. It was truly awesome and at the end of it I was nearly in tears cos I was so pleased with myself and on a total high. A bit of a weird day in all, the boat was hell on earth but if it hadn't've been then I never would've got the helicopter so kind of in two minds about it all. Apparently the journey back on the boat was gonna be worse as the winds were starting to pick up and they would be going against the tide so getting the heli was the best decision I've made EVER I think!! !